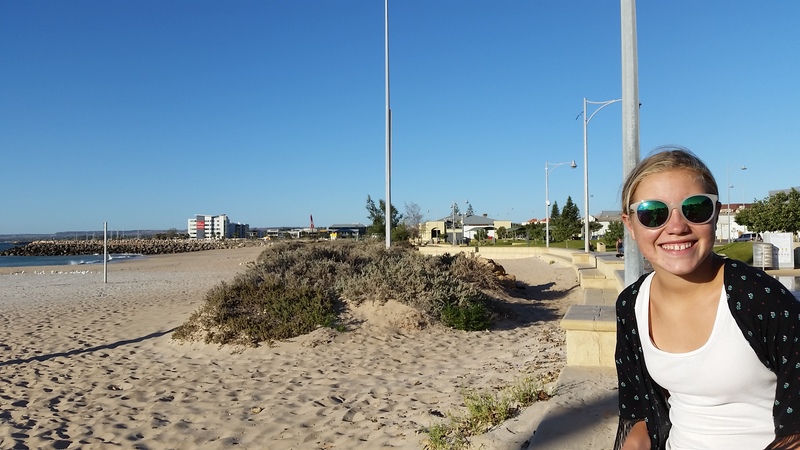 Our next destination was Geraldton, about 420km north of Perth, and the location of my First Aid refresher course, so we decided to power up and do some grocery shopping in town for a few days. 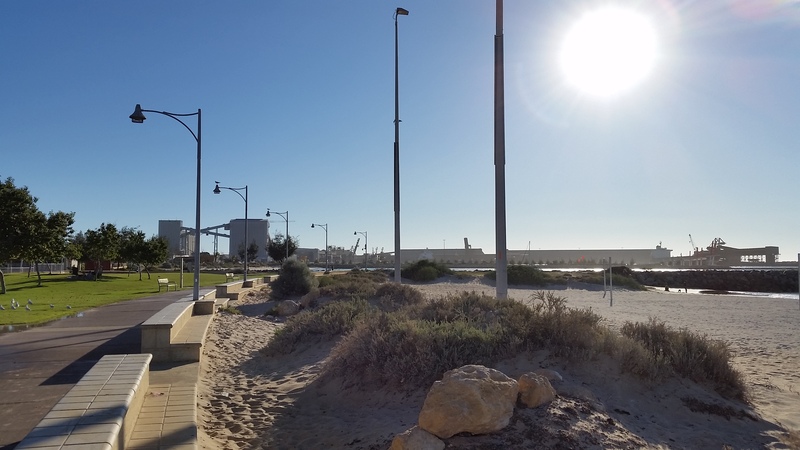 We stayed at the Bel Air Caravan Park just out of town past the docks, so quite a few times during the night we were woken by the train laden with goods and grains, passing our park on its way towards the docks to unload. 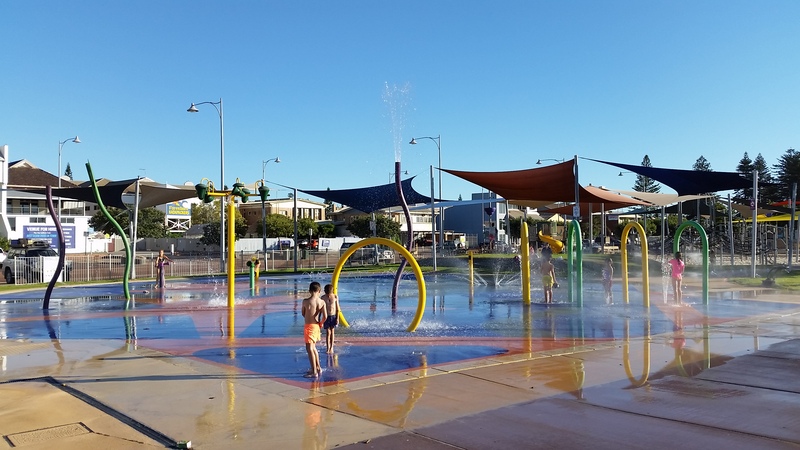 We had a few busy days in town with my course, shopping and schoolwork, but spent alot of time relaxing at the free water park and playground at the foreshore and also in the pool at the caravan park. 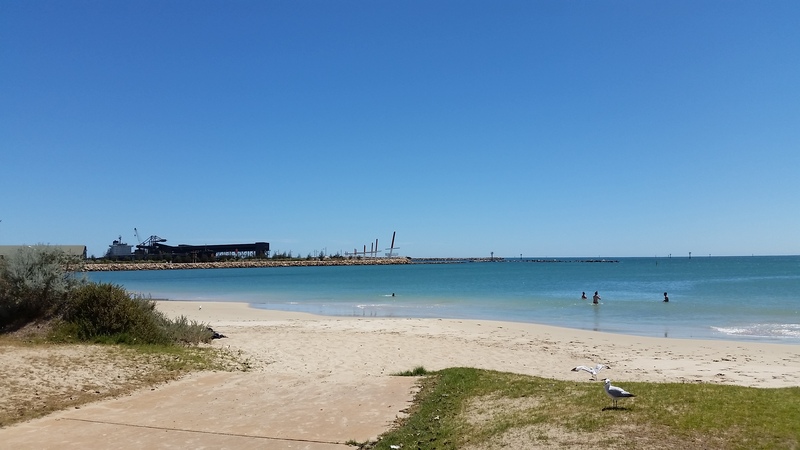 Looking to the port from the foreshore. 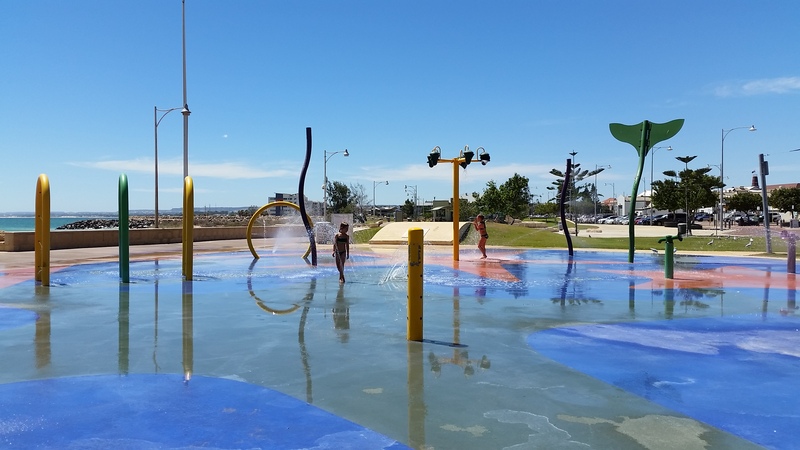 Water park at the foreshore. 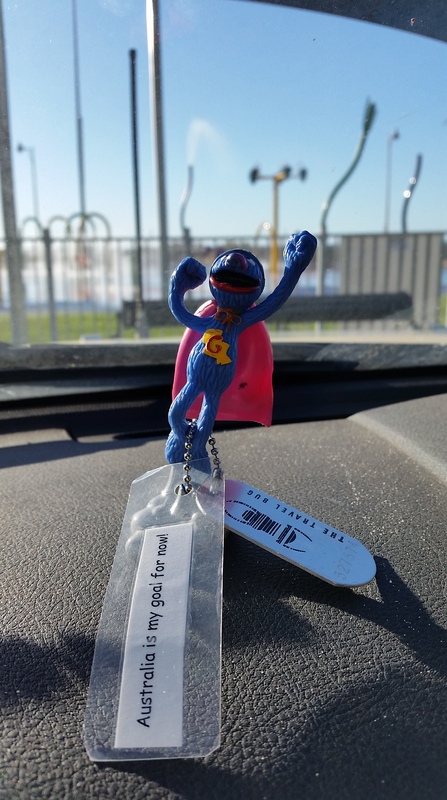 A collectable from a geocache we found in town. 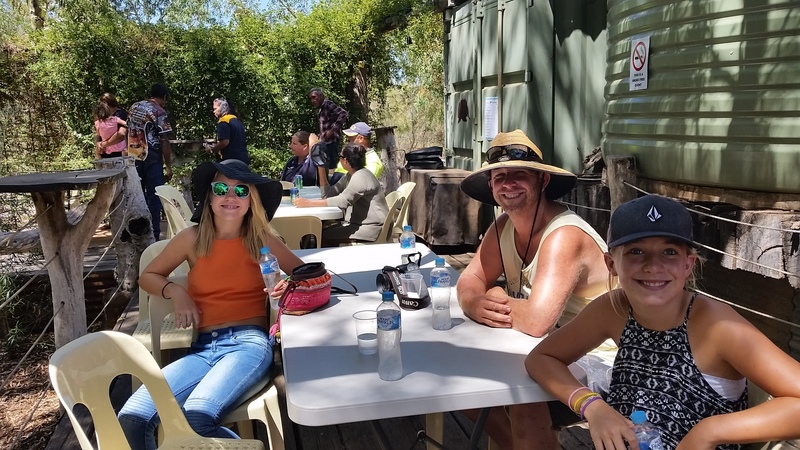 Once we completed our to do list, we then went and played tourist and visited the local HMAS Sydney II Memorial, we were very impressed as the gardens were beautiful and the memorial was very well done. 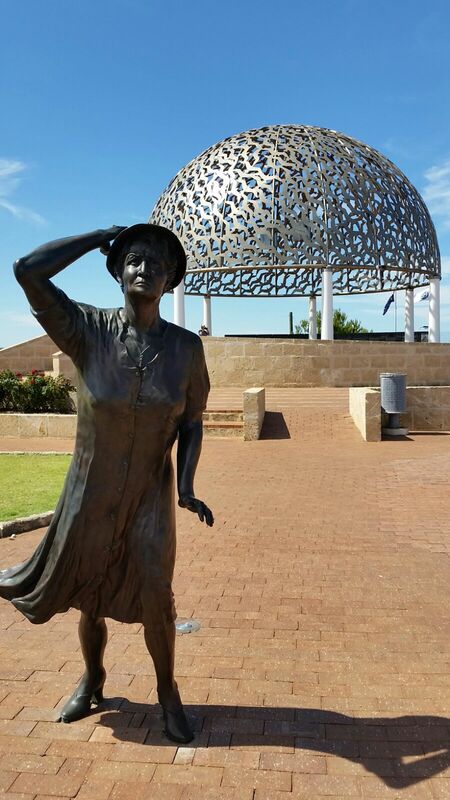 The memorial is about the HMAS Sydney II that came under fire on the 19th November 1941 from a German ship, after which a battle ensued and both ships were lost. The HMAS Sydney II had a crew of 645 men, all of which perished in this battle, the ship was never found until 16th March 2008, eventually located 207km west of Steep Point, WA at a depth of 2,480 metres. 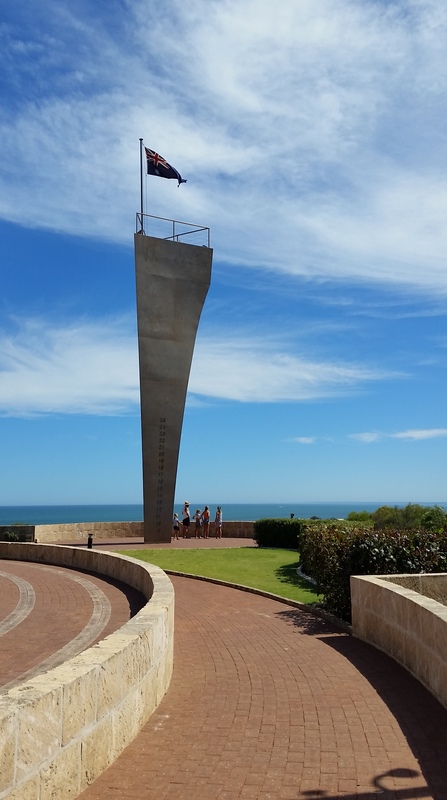 The Geraldton memorial commemorates the ships final resting place, with the tall bow structure pointing out to see to the where the ship was found, as well as the wall of rememberance which is engraved with the names of all the 645 crew that was lost with the ship. 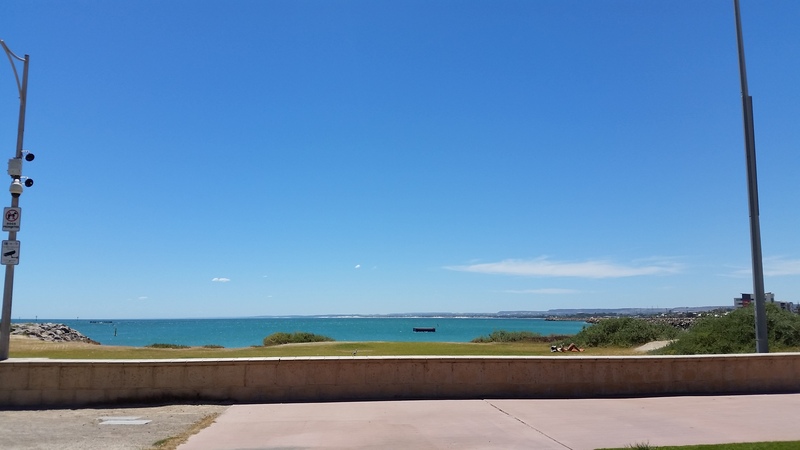 The memorial also had some wonderful views for the surrounding town and ocean. 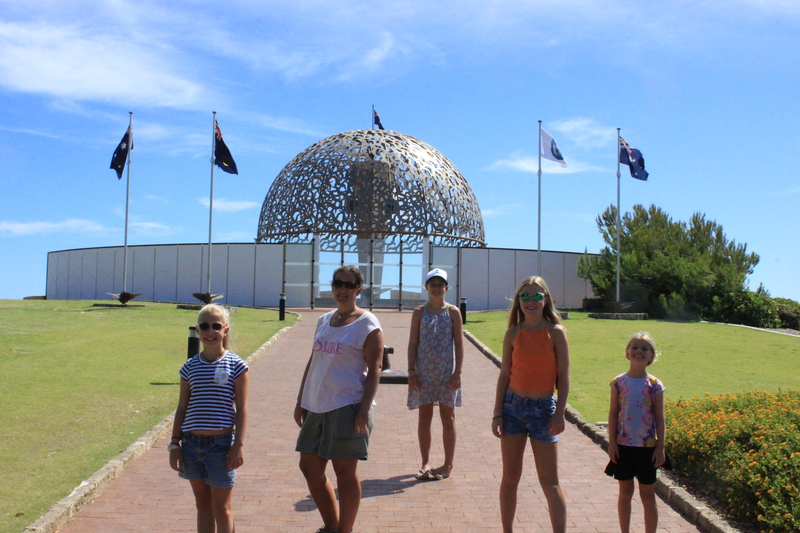 Entering the HMAS Sydney II memorial. The left Wall of Rememberance. The right Wall of Rememberance. The centrepiece of the memorial. 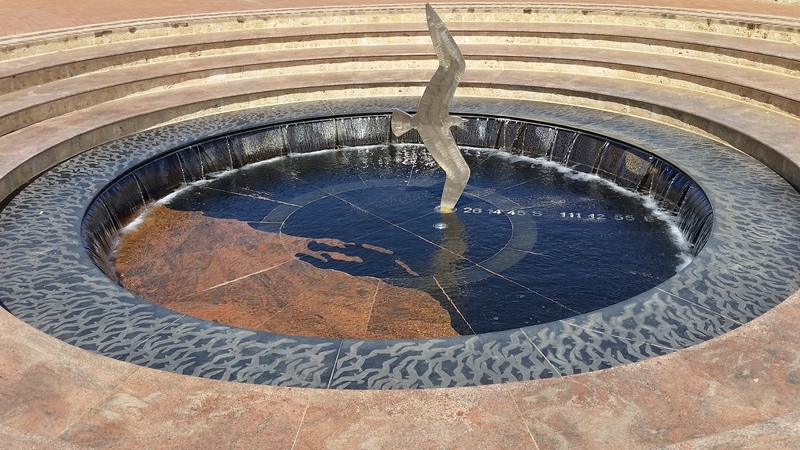 The ‘Pool of Rememberance’, commemerating the finding of the HMAS Sydney II. The bow, pointing out to sea to the location of where the ship lays. 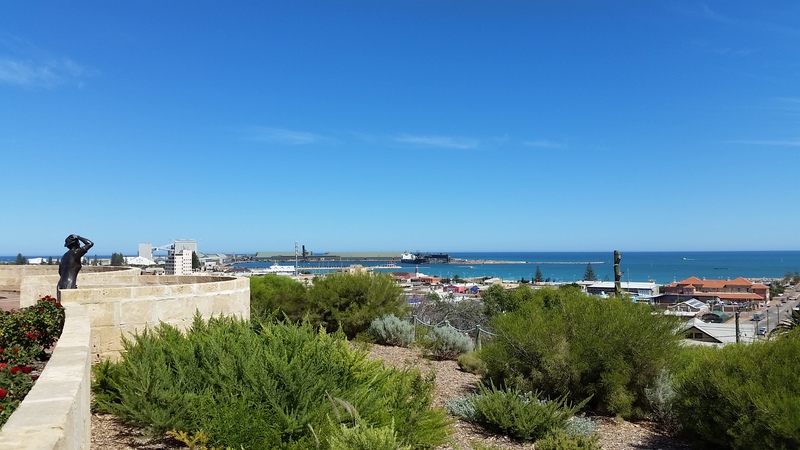 Views of Geraldton from the Memorial. 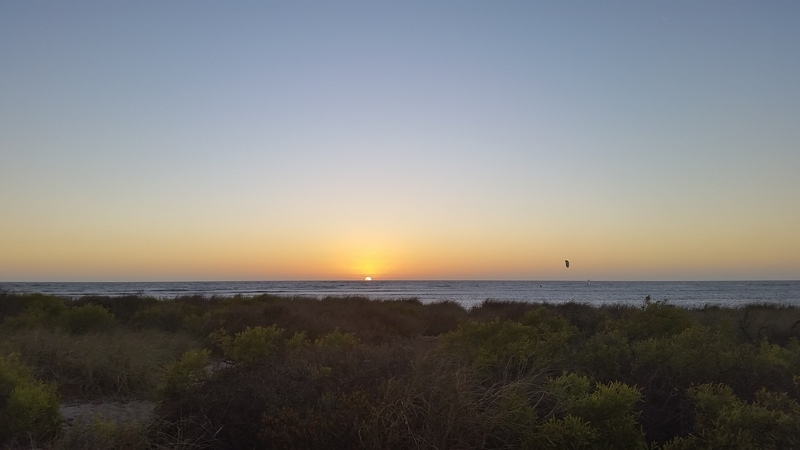 After a few days in town paying over the top prices for a powered site, we decided to head out of town to a cheap camp called Coronation Beach, where we eventually spent 10 days. We needed to ‘wait out’ a few days here to coincide with the Easter weekend coming up and quite a few station stays that we wanted to visit further up north that were not opening back up until 1st April. Coronation Beach was a great spot on the beach, however the beach was a bit too seaweedy which made fishing very difficult and swimming a little less desireable……. 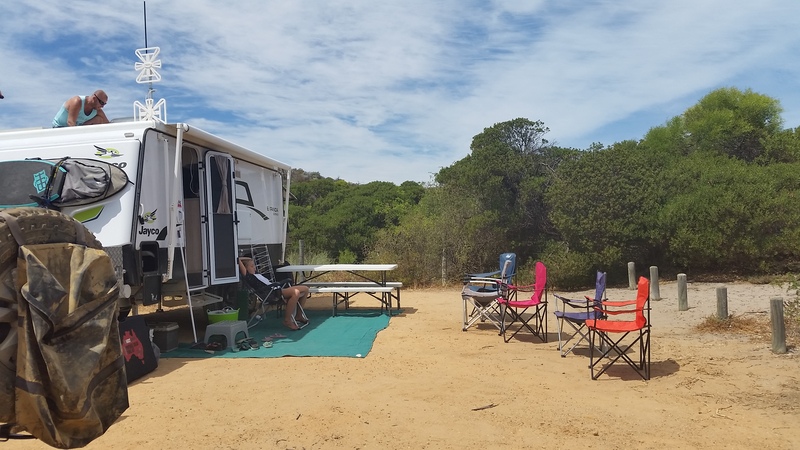 Camp set up at Coronation Beach. Nik and Abby fishing in the seaweed. 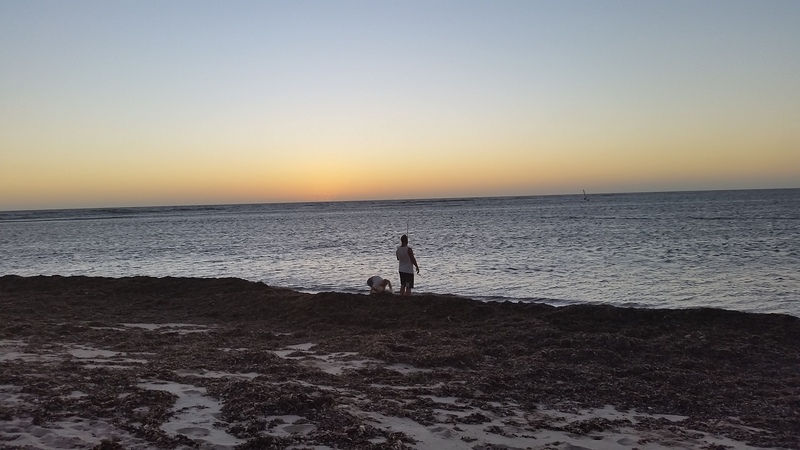 Our days at Coronation Beach were spent doing schoolwork, swimming, fishing, heading back into Geraldton for supplies and lego…. 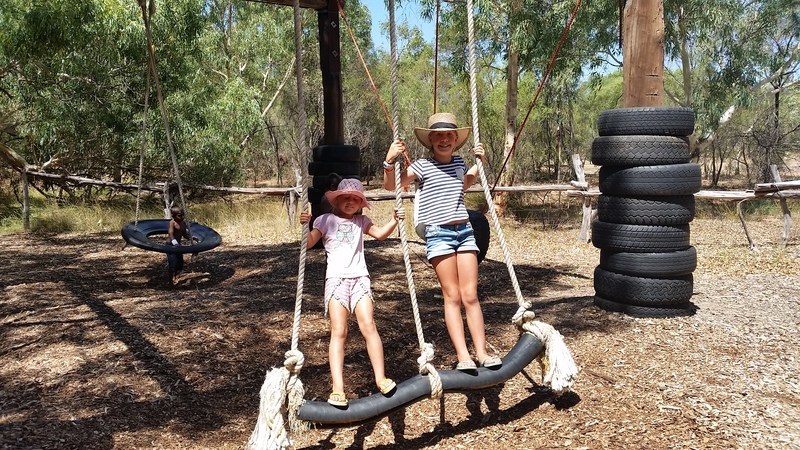 On the weekend though we were told about a Family Fun day at Nukara Farm just out of Geraldton and not far from our camp, so we decided to head out a have some fun too. 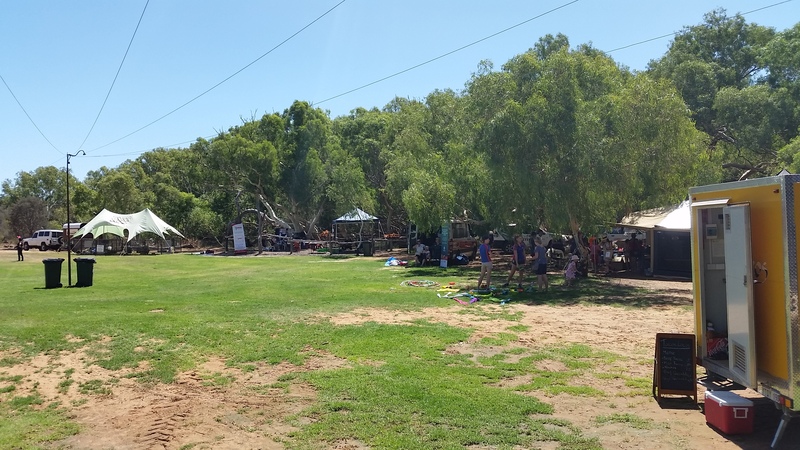 The day was actually organised by Geraldton Regional Aboriginal Medical Service or GRAMS for short, and was a day of getting families together and socialising. 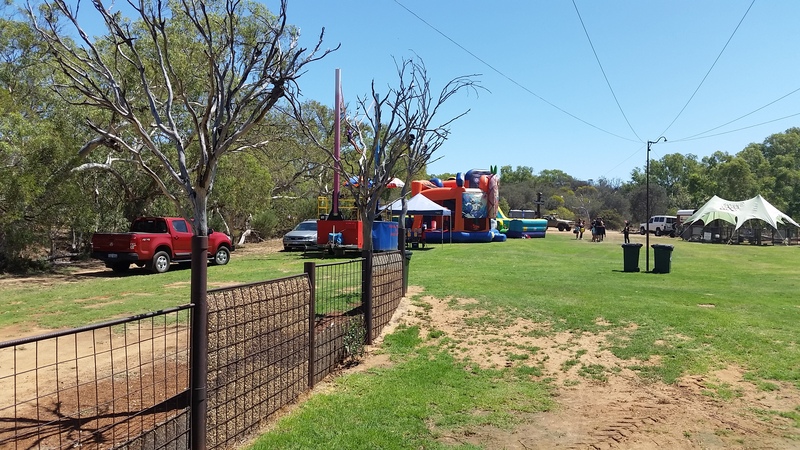 There were unflatable jumping slides, bungy jump, animal farm and circus activities available for the kids and a concert for the adults. It was a huge day that didn’t end till 7:30pm, however after being there since 10am we called it a day at around 3pm, dragging the kids reluctantly away from the rides. 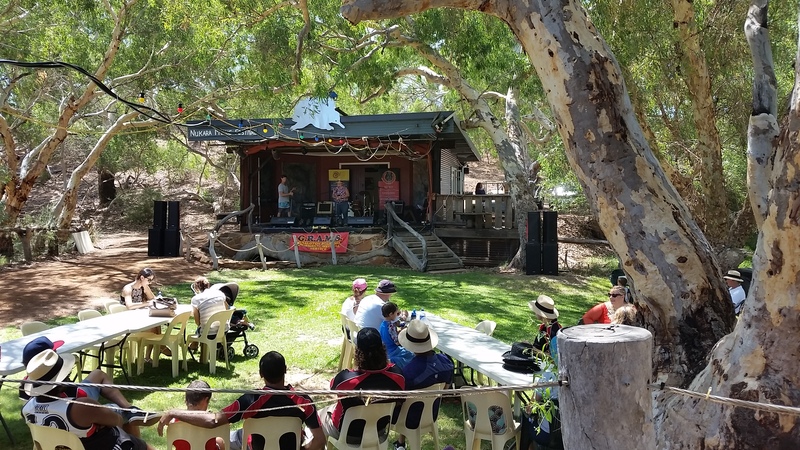 The stage for the concert at Family Fun Day. 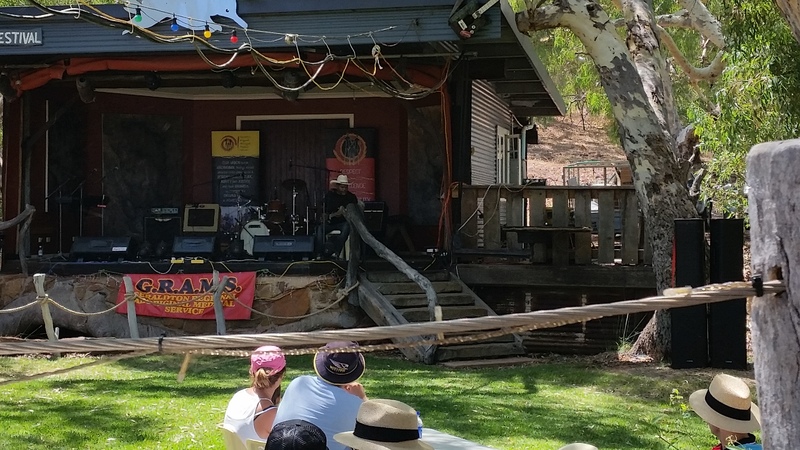 The stage was set in a beautiful shaded spot. Nik, Bec and Zoe enjoying the concert. Abs and Jess on the swing set. 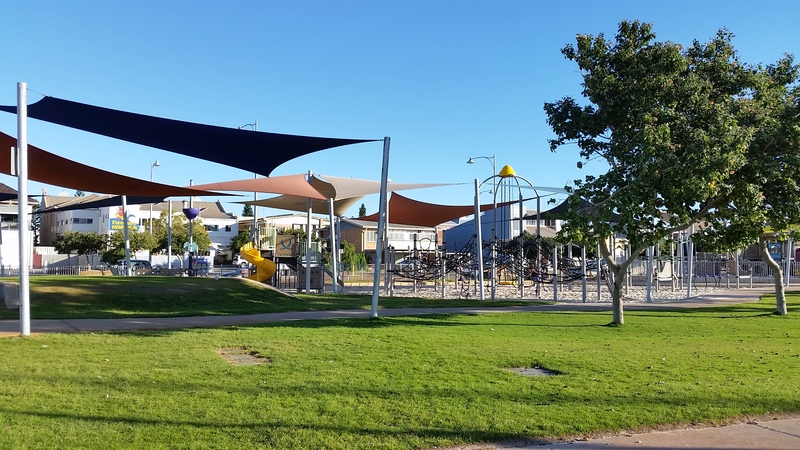 All the free activities for the kids. 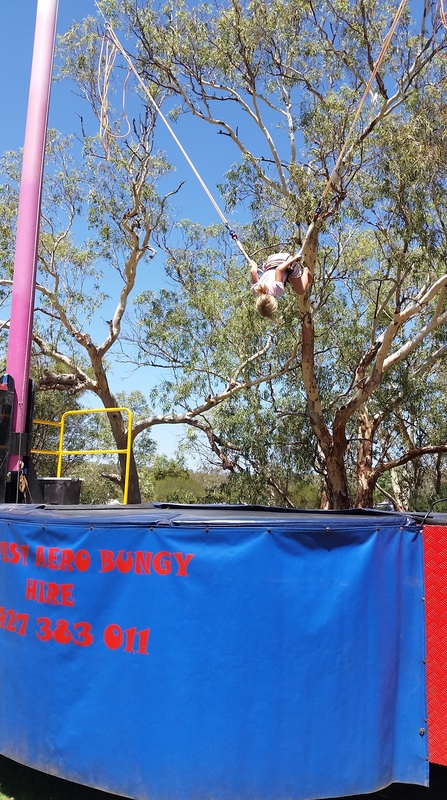 Animal farm and circus activities. Our last day at Coronation had us in town to buy some more lego… as well as restock groceries that should hopefully last us another 3 weeks as we head inland and out of service for the next destination and adventure on our OZLAP………………..
One of the many gorgeous sunsets at Coronation Beach. 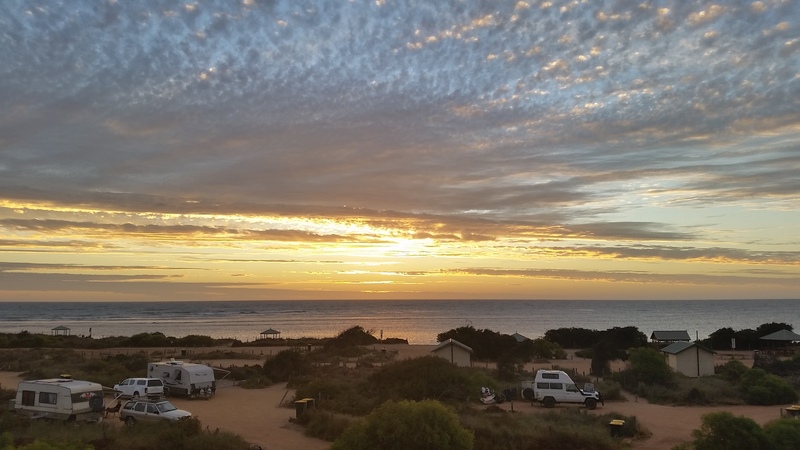 Our last sunset from the lookout at Coronation Beach.